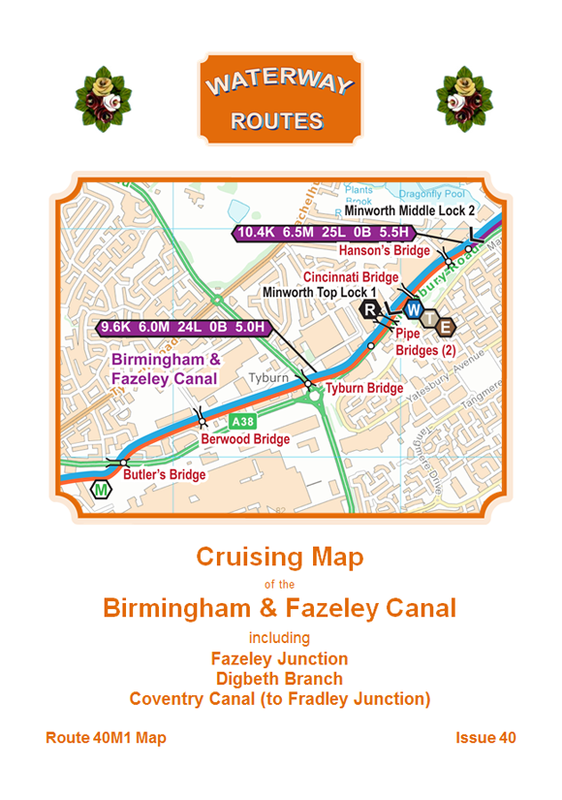 Download maps of the Birmingham & Fazeley Canal. 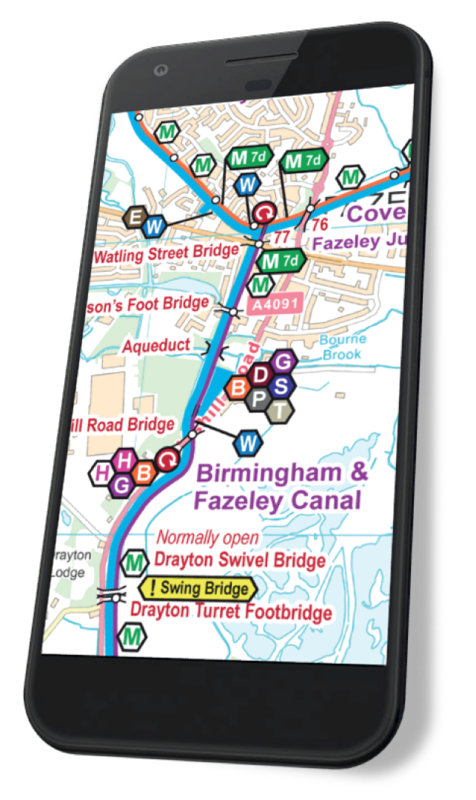 The most up to date and clearest maps of the Birmingham & Fazeley Canal are available for download. View on your computer, laptop, smart phone, or tablet, or print if you prefer the traditional paper format. GPS tracking (on devices with GPS) shows you exactly where you are as you move along the map. Monthly updates ensure you start with an up to date map, with options to keep it up to date too. 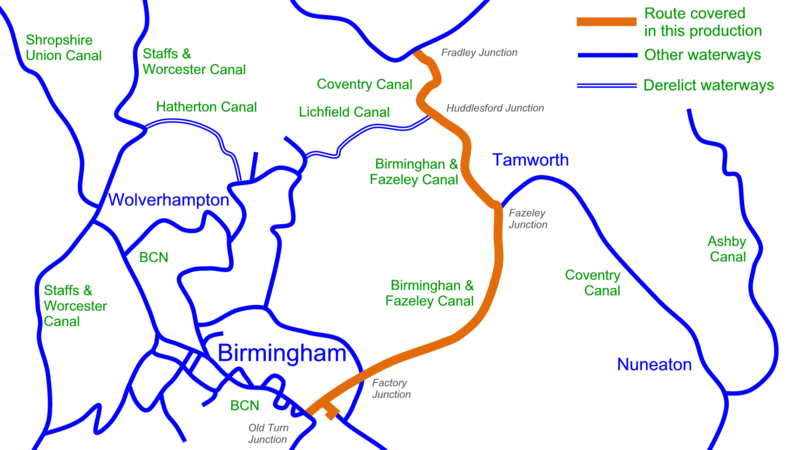 Extract from my Birmingham & Fazeley Canal Maps. Clear presentation shows the Locks, bridges, and aqueducts etc. superimposed on an Ordnance Survey (OS) background map. Icons represent all the facilities, including moorings and their time limits. Download the key to see the features which appear on the maps. Information bars, positioned every half hour, show the distance from the end of the canal, in kilometres and miles, the number of locks, the number of opening bridges, and the cruising time in hours. Route covered by my Birmingham & Fazeley Canal Maps. The Acrobat (pdf) map includes 9 pages of maps plus 4 cover pages. These can be viewed on screen a page at a time. The pages are sized for printing A4, or A5 if your eyesight is good enough. This map can be used on computers, laptops, phones and tablets with Acrobat Reader (or equivalent) software or app installed. The Memory-Map (qct) map has the same map pages joined into one scrollable and zoomable map. This map works on Android, iPhone/iPad, Windows and Mac with Memory‑Map (or equivalent) software or app installed, and the classic map compatibility option enabled. Download links are sent by email, usually within a few seconds of payment being made and will be valid for 48 hours. Please check you junk mail folders if the email doesn’t appear promptly. For a small extra charge the maps can be copied onto CD and posted to you. These are ideal if you would like something tangible to hand over as a gift. 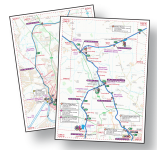 The latest map will be copied onto CD and dispatched within two working days. You will receive download links by email as well as the CD through the post. 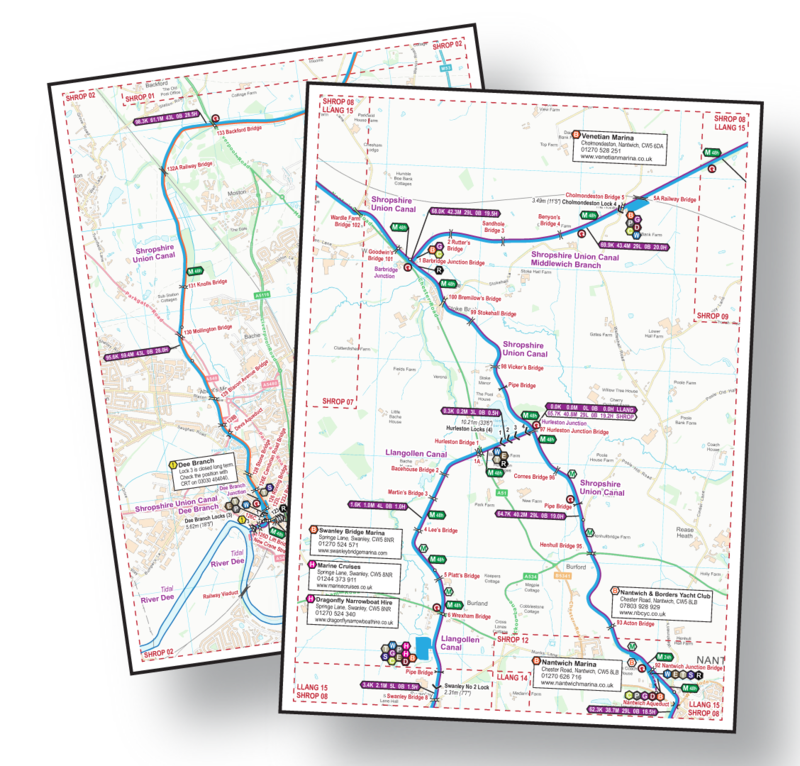 My maps for the Droitwich Canals are free to download in both Acrobat (pdf) and Memory‑Map (qct) formats. Please download and try these to see how good my maps are, and make sure you can install them on your device(s). I also produce maps for canal restoration projects which are all free to download in both Acrobat (pdf) and Memory‑Map (qct) formats. These restoration maps are very similar in style to the maps for the open waterways. The licence conditions permit you to use my maps on up to five devices. That’s computers, laptops, phones, tablets etc. The maps are licenced for personal use. Business licences are available on request. Copyright in the background maps is held by Ordnance Survey. Copyright in all other work is held by Waterway Routes. The maps should not be copied without permission except for the limited circumstances permitted by law. Black Country Ring Combined DVD. Popular – Like a television programme with highlights of a cruise, including commentary and background music. Bowcam – A forward facing camera, running all the time, then speeded up to show the whole route. England & Wales Maps which includes all the Waterway Routes maps joined into one large map which is cheaper than buying the maps individually. Black Country Ring Maps include the Birmingham & Fazeley Canal, and the rest of the ring too. £5.60 – Memory‑Map (qct) format (with free Acrobat (pdf) format). An email with links to download the file(s) is normally sent within seconds of purchase. Please check your junk mail folders if it seems to be missing.